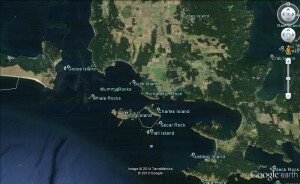 Many boaters crossing the Strait of Juan de Fuca will opt to enter the San Juans through Cattle Pass. Some boaters using Deception Pass may elect to use Cattle Pass as well, although boaters transiting between Deception Pass and Cattle Pass should avoid getting too close to the southeast shore of Lopez Island. Reefs, rocks, and other opportunities for unhappy encounters abound. Remaining an adequate distance offshore and turning directly into Cattle Pass will be preferable to bumping (perhaps literally) along the Lopez shoreline. Currents in Cattle Pass often run 3-knots, and 5-knot currents are not unheard of. To predict current in Cattle Pass, use the San Juan Channel current tables with the following adjustment. Cattle Pass turns to flood 11-minutes later and reaches maximum flood 20-minutes earlier than San Juan Channel. Cattle Pass begins to ebb 34-minutes later than San Juan Channel, and reaches maximum ebb 1-minute sooner. Current velocities for Cattle Pass are measured 1.2 miles SE of Cattle Point and average 30% of San Juan Channel during flood, but 90% while ebbing. Currents in the narrowest part of the pass can be more severe. At maximum velocities, tide rips and back eddies are commonly encountered. Be especially watchful for drift and debris in the water. A strong ebb current pouring through Cattle Pass into the Strait of Juan de Fuca can raise a serious ruckus when there’s also significant wind from the west. If a boater crossing the Strait of Juan de Fuca or transiting Deception Pass notes a brisk ebb through Cattle Pass predicted near anticipated arrival, it might be more prudent to divert up Rosario Strait and use Lopez or Thatcher Pass instead.